You are in control.There are not many constraints on a timber frame home like on a conventionally framed home, so you can be creative and do almost anything you want! We can design and build any timber frame, to any budget, for any home you have in mind. We do not offer a 'plan book'. A timber frame house is as original as the homeowner, and we would like to custom design your home to fit your current and future plans. A fully structural timber frame can be incorporated into almost any conventional plan. From a large country estate to a small cottage by the lake... whatever you envision as your dream home. We guarantee you will not be disappointed. Here at Crazy Creek Design, we mesh the old-world, traditional art of Timber Framing with the exciting new world of 3-D isometric computer drawings. 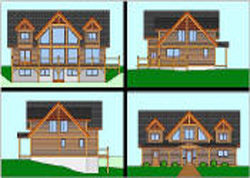 It can be very hard to visualize your timber frame home but with our 3-D isometric drawings and video fly-throughs you can see exactly what it will look like from various different views. Full shop and field drawings, as well as engineering drawings are included in our packages.